SMRG recognizes its members having served, currently serving or about to serve in the Armed Forces, in combat zones and disaster areas around the world. Welcome to the home of the Shenandoah Mountain Rescue Group (SMRG). SMRG is a professional volunteer wilderness search and rescue organization established to provide assistance to those who become lost or injured in the outdoors. Along with other member organizations of the Appalachian Search and Rescue Conference (ASRC), SMRG responds to emergencies anywhere in Virginia, Maryland, Pennsylvania, and West Virginia to conduct searches for missing persons or aircraft, and to carry out rescue operations in wilderness areas that require specialized equipment and techniques. The About SMRG section provides more information on who we are and what we do. If you are interested in joining SMRG, please visit the Join SMRG section. Shenandoah Mountain Rescue Group (SMRG) presents a preventative program for children 4-12 based in part on the Association of National Park Rangers’ “Lost, but Found Safe and Sound” video. “This 12-minute, professionally produced video is designed to show children, ages 4-12, what to do if they become lost in remote areas such as parks or forests. It follows the actions and thinking of 7-year-old Kelly, who sets out on a long-awaited hike on a beautiful day in the woods with her parents and brother. She runs ahead, gets separated from the rest of the family and becomes lost. Anne Tubiolo of the National Park Service Interpretive Design Center at Harpers Ferry produced the video with a generous grant from the National Park Foundation. The video is set in Shenandoah National Park, but it is appropriate for any geographic setting. Introduction of SMRG, what we do and the members helping with this presentation (5 minutes). Playing of the video (12 minutes). Discussion explaning main points of the video (15 minutes). Outdoor question and answer session (5-10 minutes). 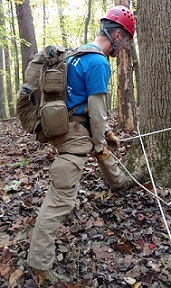 Demonstration of what wilderness search and rescue personal carry in their pack. (10-15 minutes). Stokes liter carrying demonstration (10 minutes). Handout for parents that includes major points of program. The presentation is for Girl Scouts, Cub Scouts and similar outdoor youth groups at their meeting as well as elementary school children at their school. The presentation can be tailored to your group. SMRG is a volunteer organization and the program is presented by volunteers at no cost in northern Virginia and DC-Baltimore corridor. Contact Ronald Herning at ronherning@gmail.com for more information.